Jerry Goldsmith is not a composer well known for his scores to animated films, indeed his only other to date is the wonderful Mulan (although the Disney album didn't display the score to its full advantage). The Secret of NIMH is Don Bluth's first effort after leaving Disney and remains one of his finest, even if The American Tail films are better known today. It is interesting to note that later in his career, Bluth occasionally called on the services of James Horner to provide the underscore and while Horner's efforts are, again, better known today, they owe quite a considerable debt to Goldsmith's work here (not to mention that of Tchaikovsky and Prokofiev). 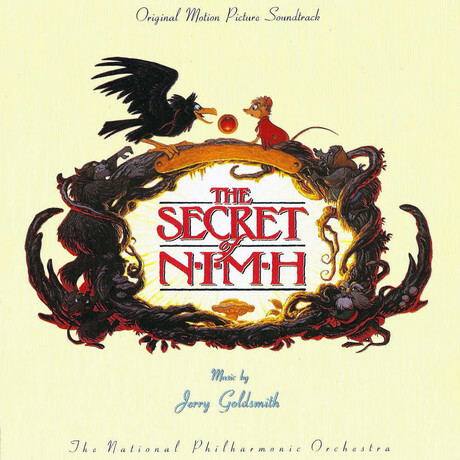 The Secret of NIMH sees Goldsmith at his most rhapsodic and Ravelian, the choral work very much in the style of Daphnis et Chloe, although this is simple influence of style over copying. Goldsmith doesn't use the choir regularly in his scores, but when he does, the results are invariably sublime and this is the case here. Although many of the films he scored weren't great, Goldsmith's style in the 80's was both inspired and instantly enjoyable, not to mention tuneful, and The Secret of NIMH stands as one of the highlights. I suppose it's only fair to mention the score's only real weakness and that is the song, Flying Dreams. As with Horner's later efforts, there is nothing wrong with the melody, which forms the main theme of the score, but when coupled with the maudlin lyrics and closely miked vocals, it becomes somewhat less enjoyable. Neither rendition is much worse than the other, but are disappointing next to the serious and seriously beautiful underscore. The most surprising aspect of the score is just how dramatic it is; Allergic Reaction, The Tractor and Escape from NIMH are all strident and brassy, with carefully placed choral writing for a fairly epic sound - ironic given that it's a film about mice. By and large, Goldsmith avoids a 'traditional' animation style of writing, even the comedic moments seem perfectly well aligned to the general tone of the score, with nothing in the way of silly musical pratfalls. The playing by the National Philharmonic and singing by the Ambrosian chorus is first rate, as is the recording, with punchy brass, lush strings and carefully highlighted woodwinds, which can be easily picked out in the complex orchestrations, but without seeming unnaturally spotlighted. The choir is placed so as to be clearly audible without swamping the orchestra. There have been several releases of the score on different labels, but aside from a slightly different running order, the contents are exactly the same. Only the disappointing song means the score fails to gain a top rating, but in every other respect is a winner and an essential in every collection, especially if you enjoy your Goldsmith tuneful, effusive, fiery and beautiful, all in one score.